Deciding how your business will turn interested leads into paying customers can be tough, and the answer is almost always unique to your services and goals. As a self-employed developer, it can be even more challenging. However, you can’t ignore the importance of working on and perfecting your business’ sales funnel. Knowing how your sales funnel operates is vital for winning new work. Fortunately, the first step on that path can greatly simplify the rest of the process. If handled correctly, the point at which curious visitors first contact you looking for help can be the perfect opportunity to set them on a smooth path toward becoming customers. In this post, we’ll look at the very first contact you’ll have with many leads – your ‘client intake’ form. We’ll discuss what this is, where it fits into the rest of your sales funnel, and more importantly, what it should include. Let’s get to work! Even if you don’t know much about sales, the ‘sales funnel’ is a concept you may have encountered in passing. Either way, however, it isn’t difficult to grasp the basics. In simple terms, a sales funnel is the process of guiding people carefully from the point when they first encounter your business to becoming conversions. This involves taking the potential customer through several stages. This is a very simple overview because each of these steps can be broken down further. For example, a ‘visitor’ can either be the result of organic traffic with no prior knowledge of your services or can come to you via your marketing efforts. Furthermore, what counts as a ‘lead’ and a ‘prospect’ may vary based on your business and goals. However, you’ll usually find that the ‘funnel’ description is apt. Usually, a site will receive many more visitors than it does leads and fewer paying customers. By imagining this process visually, you can see how each step funnels the most interested parties into the next phase. Of course, the ultimate goal is to get as many people all the way to ‘customer’ as possible. Succeeding at this relies partly on what you do at the very beginning of the process. You may have realized that each step in the sales funnel will require a different approach, in order to maximize its effectiveness. A client intake form can help you at every step of the way. In its simplest format, a client intake form is just a name, an email address, and a free-form text area waiting for user input. In other words, it’s essentially a contact form. However, a client intake form is specifically designed to ensure that each lead gives you as much information about their project as is necessary to get the ball rolling. Ideally, you’ll be provided with everything required to finish the project. What’s more, you can use this kind of form to start guiding a potential customer through your sales funnel. For example, a form designed to turn visitors into leads will ask exploratory questions about what they’re doing on your site and what they need. This is a key part of the client onboarding process. It lets potential customers ‘self-report’ their requirements, saving you time that can be spent actually working on projects. In that regard, a client intake form can be seen as a way to semi-automate your sales funnel. What’s more, by the time the client comes to you, they’re primed for being converted. In other words, they already want to buy your services, and you won’t have to break out your virtual collapsible table in order to showcase what you do. We’ve already touched on the most important element to include on a client intake form (i.e. questions). However, let’s look more closely at a few specifics. The prospect’s name, contact details, and company. What services they’re interested in. Details about the specific project, and what kind of results they’re looking for. Of course, you’ll likely want to venture beyond these few questions. What you ask will rely on the kind of services you’re offering, your own experience in what clients usually need and want, and so on. The goal is to solicit information that will tell you what the client wants, and whether you can deliver it. However, we’d advise you to consider leaving commitment-based questions for later in the process. For example, discussing budgets and project turnaround times with a new website visitor could scare them off. There’s a fine balance between encouraging someone through the sales funnel and pushing them into regressing or dropping out entirely. 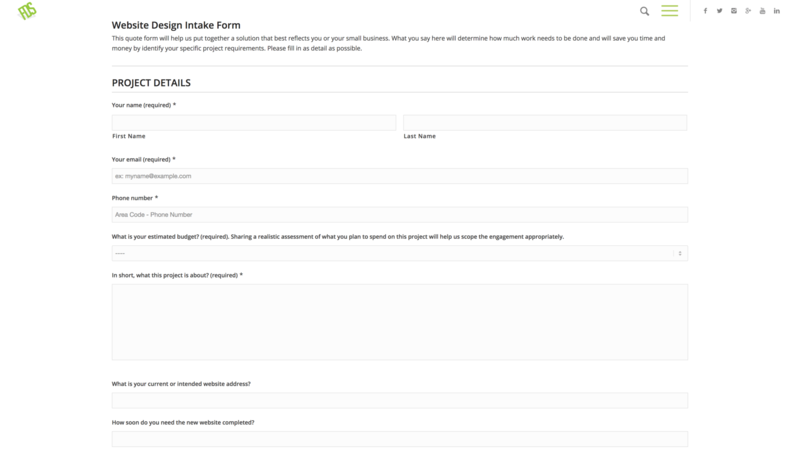 When designing your client intake form, you’ll want to lead the potential customer through as many stages of your funnel as possible, without being too overt about it. This is similar to how a landing page works. You’ll want to strive for the same effect in your own intake process. To begin, you’ll need to decide where that process starts. This could either be on your website directly or after the visitor contacts you (i.e. through email). It’s also worth considering how much of the sales funnel you’re hoping to cover in the intake form. For instance, if you’re just looking to capture leads, you may only need a simple contact form. However, you can also use various sections to take them through a number of stages (similar to the landing page process described above). As for how you actually create this intake form, there are plenty of tools that can help you out. HubSpot, for example, offers a template designed specifically for agencies. You can also use a more general form-building solution. Gravity Forms, Ninja Forms, Elementor Pro, and many similar plugins will be well-suited to the task at hand. Once it’s built, all that’s left is to feature the intake form somewhere prominent on your site. While we may be stereotyping a little, it’s fair to say that development knowledge and business acumen don’t always go hand-in-hand. However, learning about some key business concepts – such as the sales funnel – can help you win more business and traverse smoothly through project after project. A client intake form is a fantastic first step down that path and can be all you need to get a new project off the ground. You can position this form as a way of a) finding out more about your potential customer, and b) guiding them through as much of your sales funnel as possible. It may take a little work, but getting this right should mean an uptick in your current income. Do you have any questions about how to implement a client intake form on your website? Let us know in the comments section below!